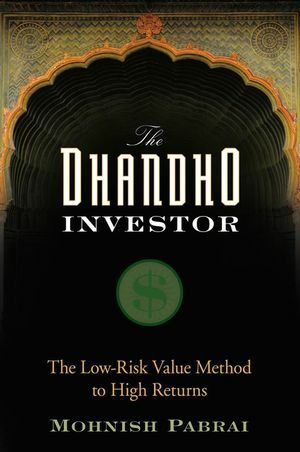 In a straightforward and accessible manner, The Dhandho Investor lays out the powerful framework of value investing. Written with the intelligent individual investor in mind, this comprehensive guide distills the Dhandho capital allocation framework of the business savvy Patels from India and presents how they can be applied successfully to the stock market. The Dhandho method expands on the groundbreaking principles of value investing expounded by Benjamin Graham, Warren Buffett, and Charlie Munger. Readers will be introduced to important value investing concepts such as "Heads, I win! Tails, I don't lose that much!," "Few Bets, Big Bets, Infrequent Bets," Abhimanyu's dilemma, and a detailed treatise on using the Kelly Formula to invest in undervalued stocks. Using a light, entertaining style, Pabrai lays out the Dhandho framework in an easy-to-use format. Any investor who adopts the framework is bound to improve on results and soundly beat the markets and most professionals. Mohnish Pabrai is the Managing Partner of Pabrai Investment Funds, an investment group modeled after the original 1950s Buffett Partnerships. Since its inception in 1999, Pabrai Funds have delivered annualized returns of over 28% (net to investors). He has been favorably profiled by Forbes and Barron's and has made guest appearances on CNBC and Bloomberg TV and Radio. 6. Dhandho 101: Invest in Existing Businesses. 7. Dhandho 102: Invest in Simple Businesses. 8. Dhandho 201: Invest in Distressed Businesses in Distressed Industries. 9. Dhandho 202: Invest in Businesses with Durable Moats. 10. Dhandho 301: Few Bets, Big Bets, Infrequent Bets. 11. Dhandho 302: Fixate on Arbitrage. 12. Dhandho 401: Margin of Safety—Always! 13. Dhandho 402: Invest in Low-Risk, High-Uncertainty Businesses. 14. Dhandho 403: Invest in the Copycats rather than the Innovators. 15. Abhimanyu’s Dilemma—The Art of Selling. 16. To Index or Not to Index—That Is the Question. 17. Arjuna’s Focus: Investing Lessons from a Great Warrior.